As we age, fat is lost from the face, giving way to a hollow and sunken appearance. This is especially apparent around the eyes where dropping of the brows, saggy upper lids and hollows under the lower lids can make you look older than you truly are. Luckily, Dr. Guy Massry, Beverly Hills Cosmetic Eyelid Surgery Specialist, can correct these issues using hyaluronic acid gel fillers to instantly add volume around your eyes, and delay the need for surgical intervention. The eyes and surrounding areas are very delicate structures with a complex anatomy. It is very important that when deciding to undergo any sort of treatment to this area, whether it be surgical or non-surgical, that you find a proven expert. Dr. Guy Massry is a board certified ophthalmic plastic & reconstructive surgeon who practices in Beverly Hills, California, with immense knowledge of the eyelids and surrounding areas. He is at the forefront of minimally invasive anti-aging procedures and offers his patients remarkable results. When evaluating a patient’s needs, Dr. Massry believes that true rejuvenation of the mid and upper face comes from taking an expanded and comprehensive treatment approach. By treating several areas together he is able to bring harmony to the overall facial appearance. In many cases, Dr. Massry finds that using fillers in the under eyes, brows and temples provide patients with the best and most natural looking results. See below the before and after result of a woman who had filling of the temples, brows, upper eyelids and under eye hollows with Restylane (a Hyaluronic acid filler) in one session. Please view the accompanying video links to see the actual video presentation of Dr. Massry’s specialized technique for this procedure. Under eye hollows are very common among men and women and are a result of volume loss due to age. 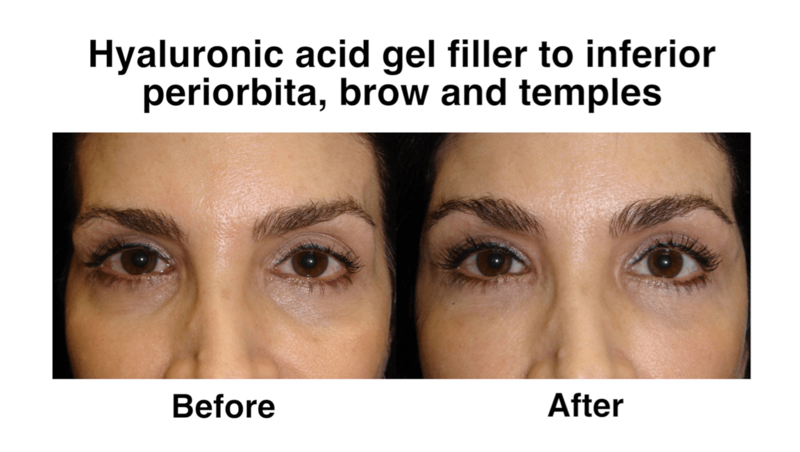 Dr. Massry can use hyaluronic acid gel to restore volume under the eyes and minimize the sunken appearance. In the video below, Dr. Massry demonstrates his expert filler injection technique to address under eye hollows. After administering a nerve block for the patient’s comfort, he starts with deep injections followed by more superficial injections. When he is done placing the filler, he massages the area to contour the results. As you can see from the video, this treatment instantly takes years off the patient’s appearance. The eyebrows frame the eyes and face, and when they begin to droop or sag it has a dramatic effect on our overall facial appearance. To lift the brows up, improve upper lid appearance, and restore volume, Dr. Massry strategically places hyaluronic acid gel filler (in this case Restylane) above and below the brow. In the video below, Dr. Massry explains his innovative approach to placing filler in the upper eyelids and brows. He first administers a nerve block for the patient’s comfort. The calls the technique he uses for his filler injections in this location the Lift – Inject and Massage Method. Dr. Massry lifts the brow so that he can inject right along the brow bone. He then injects the filler using a cannula (to reduce bruising), and finally he massages the filler to contour it perfectly. This process is then repeated in the medial brow area. It is important to inject above and below the brow for the best 3-dimensional tissue expansion and to prevent contour irregularities. One of the most overlooked and under-addressed areas of the upper face are the temporal hollows. This is the region on each side of the face between the top of the cheekbone and start of the bone next to the eye. When this area looses volume, the resulting concavity disrupts the frame of the face and produces an unflattering shadow effect. When hyaluronic acid gel filler is added to the temples, it restores a better overall shape to the face and creates a smooth transition from the periorbital area to the temporal hairline. If your eyes are not looking as youthful as they once did, come see Dr. Massry so he can help you look your best again! Call us today to schedule your eyelid fillers consultation with the best oculoplsatic surgeon in Beverly Hills – 310.657.4302.